Tonight’s matchup determines who will walk away with the TVL Large title. Holliston and Ashland last met up in 2012 and the result was a Holliston 49-7 win. This season Ashland moved back to the TVL large which means this could be a new yearly rivalry in the making. These two teams have a long history dating all the way back to 1896. Since 1896, Ashland and Holliston have met up 45 times and Holiston has won 32 of those meetings. The Holliston Panthers went through what was considered for them a transition year last season. They made the playoffs but lost in round 1 to Scituate. After the loss, Holliston ended up finding some offensive momentum in some later non-playoff games and that began the transition to the successful undefeated team they are currently this season. Ashland was a non-playoff team last year but finished 5 and 6 overall and developed some of their talent significantly. 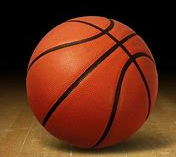 The Clockers have moved up to the TVL Large this season and have overwhelmingly proved they are ready for the transition. So far this season Ashland has taken down Medway, Sharon, Medfield, Hopkinton, Norwood and Westwood. Holliston has defeated Norton, Westwood, Medfield, Hopkinton and Norwood. Both teams undefeated but how do they compare? Holliston has scored on average a whopping 36 points a game while giving up only 9 points on average. Ashland averages 19 points a game but has gotten the job done with their defense which gives up only 10 points a game. The Clockers have split time at QB this season with Jackson Hornung and Dom Cavanaugh getting an almost even set of reps under center. 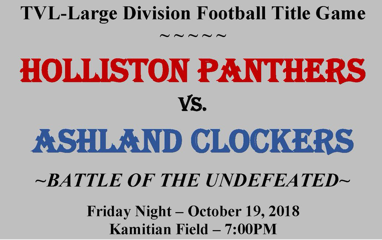 The Clockers will certainly need to dial up some offense tonight to take down this years highly potent Holliston Panthers team. Hear the game live Friday October 19th 6:45pm on MYFM 101.3!